To access the schedule, click the calendar icon at the top of the screen. There are three layouts you can choose from when building your schedule (Layouts drop-down menu on right hand side above schedule). 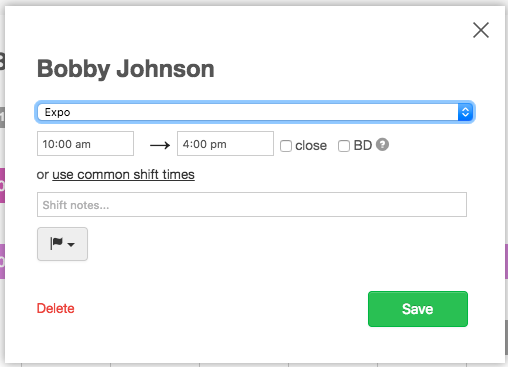 To add a single shift in any view, simply click the + sign within the Time Frame and day of the week you'd like to add to. The 'List by Role' layout will list your Employees under Role headers. If an Employee is assigned to many roles, they will be listed under the Role you have designated as their Primary Role. To have an Employee appear under a different Role title, simply click and drag the employee's name to another Role. You can then assign shifts to each employee. This 'List' layout will simply list all your Employees to the left. Similarly to the 'List by Role' layout, you can change the order the Employees appear by simply click and dragging the Employee name cell. Below the Employee's name, you can see how many hours they are scheduled for during that week, as well as the total labor costs. The labor cost will be based on the hourly wage or weekly salary that you've entered in the Employee's profile. If you have multiple Locations, you will see the total hours for all Locations. However, you will only see the labor cost for the Location you are on. In this layout, the schedule is organized by Role and shift time. You will likely prefer this view if you want to make sure you have the right coverage for each shift time. When you click to add a shift in a specific Time Frame, you can see all available employees, and how many hours each employee is already scheduled to work. Click here to find out how to create Time Frames in your account. 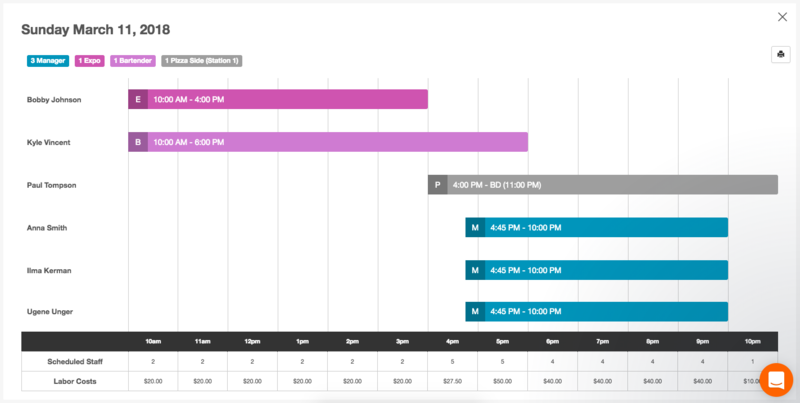 You can also add new ones directly on the schedule page using the Time Frames layout. Tip: As you are building your schedule, click on the 'bar graph' button below the date. You'll then get a bar graph view of the day. You can also make changes to specific shifts on this view. Simply click on the bar for the specific shift, and you'll see the shift edit box appear. Make any necessary changes and click 'Save' to save the changes as an unpublished shift on both the Daily Roster and Schedule views. 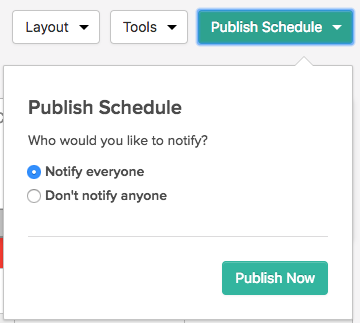 When you click on Publish at the top right of a draft schedule, staff will immediately receive a text message/push notification and email indicating their shifts for the week. Until you are ready to publish the schedule, the changes you make are being auto-saved. All shifts in draft mode will appear in a light yellow colour. These shifts are NOT visible to Employees. If you need to make changes to a published schedule, no problem. 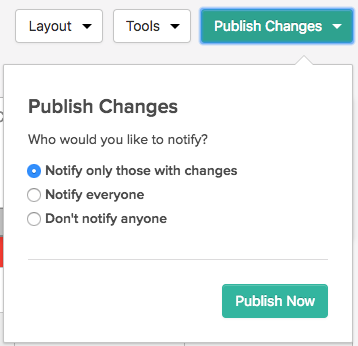 You can re-publish it and only notify employees that had changes to their shift.